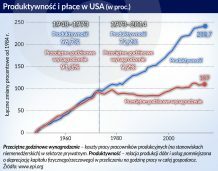 Dziennikarka dziennika Puls Biznesu, specjalizuje się w obszarze inwestycji zagranicznych w Polsce i na świecie. Even if the investment wonder of Budapest is only an aberration in statistics, Poland could learn a lot from its fellow state. Hungary has developed a number of solutions that encourage enterprises to invest capital in the country. It is worthwhile to follow in their footsteps. Location in the centre of Europe, perfect for production, services and logistics. Excellent infrastructure, complete production plants, offices and scientific parks. Good labour costs to quality ratio, government incentives (cash grants and tax reliefs), investor-friendly economic policy and a competitive tax system. It seems we are reading a list of assets Polish authorities use to convince foreign concerns to invest in Poland. However, this is a list found at the website of HITA (Hungarian Investment and Trade Agency) – an agency responsible for attracting investments and supporting exporters in Hungary. We like viewing Poland as the heart of Europe, a perfect place for investments, the link between the East and the West. It looks like we are not the only ones. In addition, Hungarians are more successful, at least this year. Data from the United Nations Conference on Trade and Development (UNCTAD) show that in the first half of the year, Budapest managed to attract USD 6.3 billion foreign direct investments (FDI). Out of the 18 developed European economies, Hungary thus ranks 11th. The result may not be overwhelming, but we must not forget that Hungary is a small country with a population of 10 million. If we add that in the first six months of previous years the country saw outflow of capital, the change becomes even more spectacular. For comparison: in the first half of the year, investors withdrew USD 1 billion from Poland. Experts advise nonetheless to be cautious about the above data. “Analysing current investments in the time frame of half a year, a quarter or a year is close to impossible as we know nothing beyond figures. Information on where they come from, whether they are new investments or if an enterprise was purchased and what was the target of investments emerge with a significant lag. 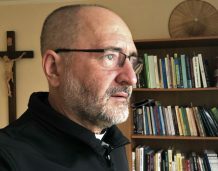 Also, good first six months of a year does not guarantee the annual result,” said Zbigniew Zimny, lecturer at the Academy of Finance in Warsaw, UN FDI expert. Hungarians are not overenthusiastic either. “Most of the high inflow of investments in the first half of 2012 reflected capital in transit and a transaction worth EUR 3 billion which resulted in capital export,” said Richard Horvath from HITA. Export of capital stands not only for foreign direct investments, but also for portfolio investments, deposits and loans. Indeed, quoting after the report by the Magyar Nemzeti Bank (Hungarian central bank), in the first half of the year the inflow of investments in the form of share capital and re-investments was EUR 618 million, and other capital (including liabilities) amounted to EUR 4.2 billion. The total is EUR 4.8 billion, or the USD 6.3 billion referred to by UNCTAD. Capital in transit, or funds flowing through a country for tax reasons, has always been extremely high in Hungary. In the years 2007-2008, it was several dozen billion dollars. 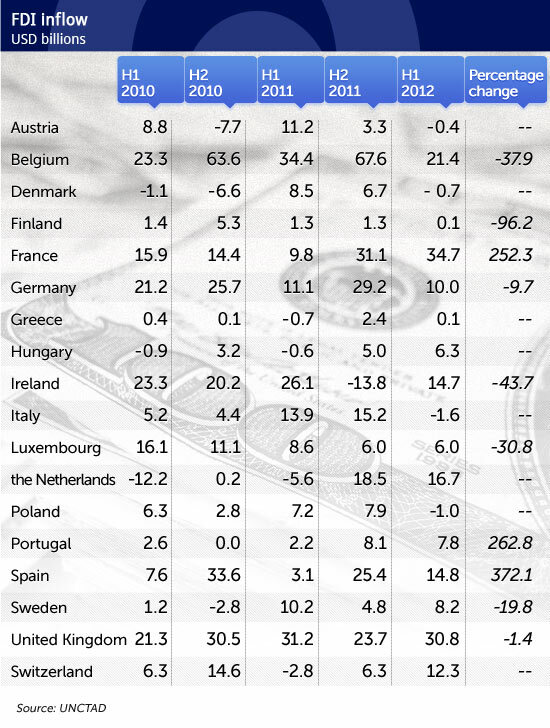 UNCTAD’s World Investment Report has given data on Hungary less capital in transit from 2011. But even with less than a billion euro of actual foreign direct investments, Hungary ranks better than Poland, which saw an outflow of capital in the period. The success of Hungary, small as it is, stems from foreign enterprises currently present in the country that are expanding their operations (not only re-investments, as the companies may spend much more than the profit they have generated in Hungary). The phenomenon (called expansion) was first described by fDi, a research centre from the Financial Times group that deals with FDIs, in its report on foreign investment in 2011. According to the report, between 2004 and 2008 the share of such investments decreased globally from 17% to 11%. That was the time of growth, many companies opened new plants and centres in emerging markets, while developing the existing branches was considered less important. The trend reversed in 2008 with the onset of the global financial crisis. In 2011, outlays on expanding proven centres increased to 23% of global FDIs. In Ireland, development projects constituted close to a half of all investments (49%) in 2011. 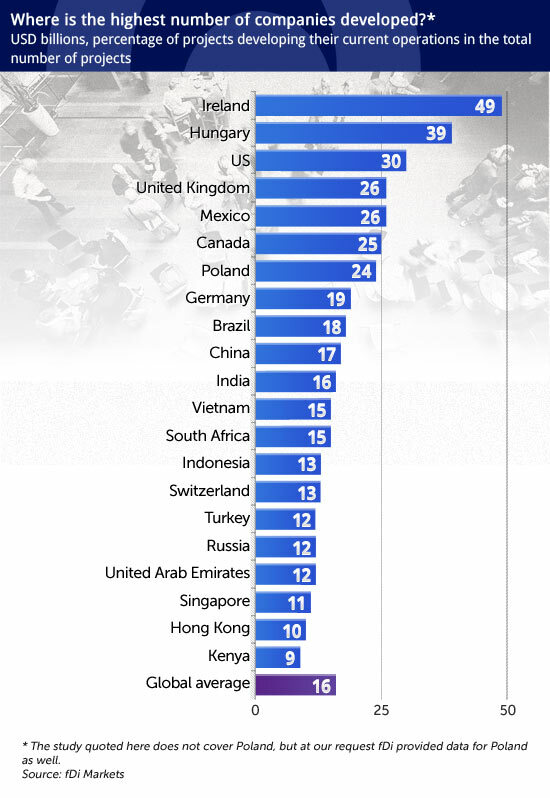 Hungary ranked second with a 39% share of such projects. The fDi states the figure for Poland was 24%. According to the centre’s experts, Ireland and Hungary are regional production hubs for global concerns, which is why development projects have won such a high share in investments in these countries. The most recent example of expansion in Hungary is the project by Avis Budget Group presented in September. The car rental company is expanding its service centre by 235 FTEs. The investor was attracted by an incentive package, but its specific nature remains a secret. Hungarians value re-investments. The annual prizes awarded by HITA to investors include the category of a Business Expansion of the Year (in Poland, prizes are awarded to investors by the Polish Information and Foreign Investment Agency; there is no such category). Last year, the prize was awarded to Audi Hungaria, a car manufacturer that has spent close to EUR 4 billion on production plants in Hungary and is in the process of implementing another project: building a new plant for EUR 900 million. Hungary launched a special programme to support re-investment. Under the programme, HITA gathers the opinions of companies already present in Hungary. “The programme aims to establish long-term relations with businesses who invested and settled in Hungary. We would like to measure their satisfaction with our investment and legal environment. The answers we are given will be passed on to relevant ministries and authorities with a view to improving investment conditions and the country’s competitiveness,” declared Richard Horvath. The Polish Information and Foreign Investment Agency has surveyed investors on the investment climate for several years now. Survey reports are submitted to a relevant department of the Ministry of Economy, where they are sometimes used. The investment package announced by Waldemar Pawlak this autumn included several dozen solutions in response to the problems faced by foreign investors. Unfortunately, the Minister of Economy has just resigned. Hungary has an organisational advantage. 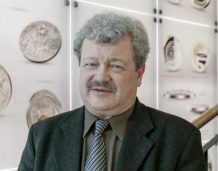 HITA was launched on 1 January 2011 as a government agency (before, there was ITD Hungary, more similar to the Polish Information and Foreign Investment Agency). HITA staff are state officials, closer to decision-makers than the Polish Information and Foreign Investment Agency that is bound by spurts of ministers. Apart from the re-investment programme, HITA also runs the Investor-Friendly Location Programme and grants the Investor of the Year Award. The Investor-Friendly Location Programme is not the equivalent of the Polish programme Grunt na Medal (the Golden Site) under which the Polish Information and Foreign Investment Agency awards the best locations (and promotes them). The first edition of the Hungarian Programme was launched on 1 March 2012 and lasted until 25 June. Its purpose was to prepare local authorities to handling domestic and foreign investments and creating their own strategies by providing them with theory and practical skills. The course covered investment promotion, marketing, communication with investors, introduction to macroeconomics, strategic planning, negotiation strategies and presentation techniques. Participants had the opportunity to learn how investors think and what criteria they apply when selecting locations, what to highlight when meeting with delegations of investors and what mistakes to avoid. The programme was launched in Hungary although the country has already been considered the best location for investments in Europe in 2011. This year’s ranking by Site Selection, a magazine on production plant locations, which evaluated the way states and metropolises handled attracting investors last year, ranked Hungary first in Eastern Europe (the winner in Western Europe was Ireland again). Poland ranked second. 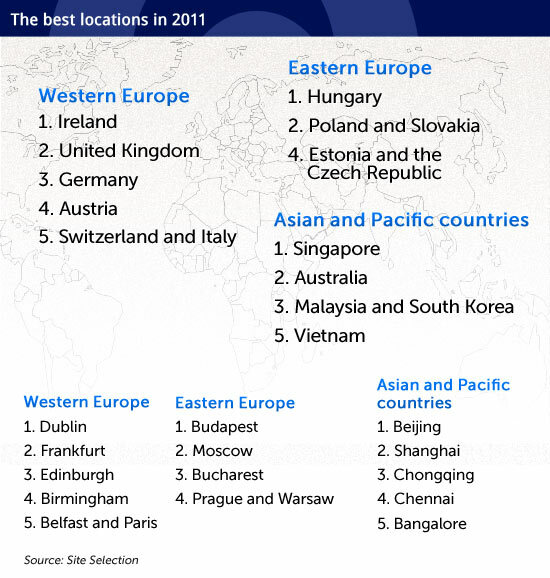 In the ranking of cities, Budapest won while Warsaw ranked only fourth. Yet even the best programmes may not suffice to protect Hungary from disfavour with investors. The country lacks political stability, and it is stability that is one of the most important factors attracting international concerns to invest money in a given country. The most recent survey on investment climate in Poland shows it is our country’s asset appreciated by as much as 79% of foreign companies (no negative opinions). Poland’s general grade was 4.1: it has been on a steady increase since 2007, when it was only 2.2 (on a five-grade scale). Hungary is playing with fire as its government is clashing with Brussels over the excessive deficit procedure, negotiating with the International Monetary Fund and juggling fiscal burdens. At present, HITA is handling 90 projects and has received another 57 inquiries. The projects’ value is EUR 1.7 billion – if all of them were implemented in Hungary, 17,000 new jobs would be created. For comparison: the Polish Information and Foreign Investment Agency is working on 132 projects whose value is EUR 4.2 billion, which may create 25,100 jobs. Investment agencies are responsible for an average of 10% of all projects. It will be interesting to see the balance of investments at the end of December and compare this year’s results.